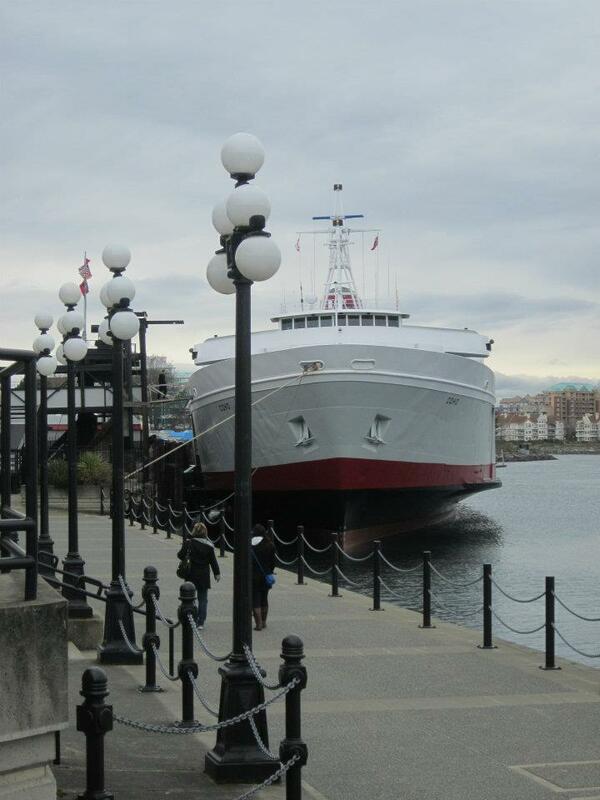 O Canada…and a little bit of Seattle! Well – I’m back again – this is getting serious, three times in one week. I’ve had kind of a stressful day thus far so I’m hoping blogging will help with a little of the stress. So, without further ado, back to the vacation. 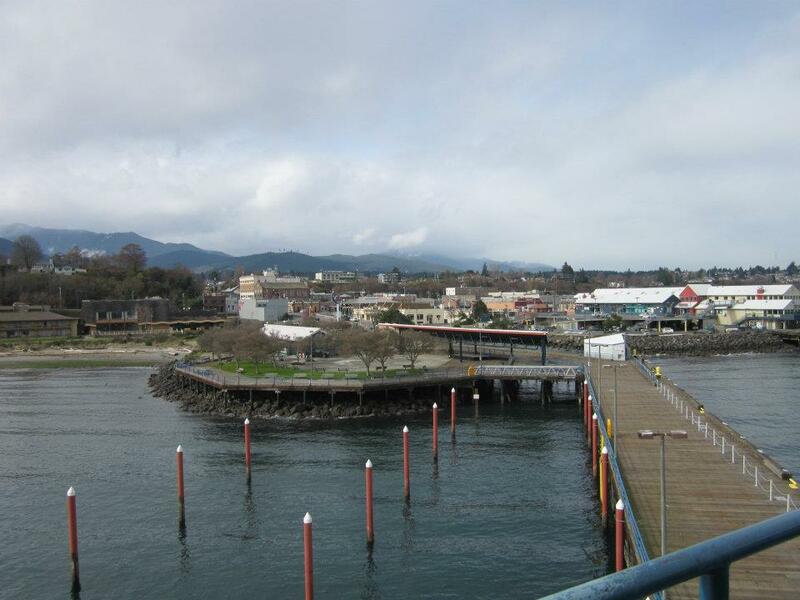 Lindsey & I took the ferry, called the Coho across the Strait of Juan de Fuca from the town of Port Angeles Washington to Victoria British Columbia. Before we even boarded the ferry, we had a moment of slight panic – nothing major but I know we both freaked out a little bit. Our turn to flash our passports came up & the guy took a look at mine & said “Your passport is not valid.” Lindsey was in front of me & she came to a dead stop & spun around – I was completely confused because I had only just gotten the passport, how was it not valid? He then said “You just need to sign it at the bottom before you get to Canada, that’s all.” I mean, do you have to give us a heart attack?? Geez. The boat we went on was absolutely huge – but I don’t think I really gathered how huge until we came back. On the way to Victoria there were several cars on the ferry, but when we boarded to go back to Washington there were 2 18 wheelers on board – along with several RV’s & cars. It was a big ol boat. We were only going 22 miles, but it took about an hour and a half to get from one place to the next. It was a nice ride though, just a little bit of rocking along before Canada came into view & we made out way into the harbor. Seriously – she was too excited. Of course, so was I. 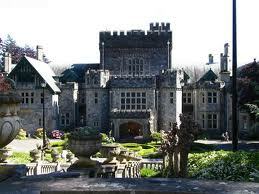 The Luthor Mansion as it appeared on the show. ﻿After we’d explored the Castle, we walked back to the bus stop & went back into down town. We ate lunch at a place called The Stickey Wicket – anyone know what a wicket is? 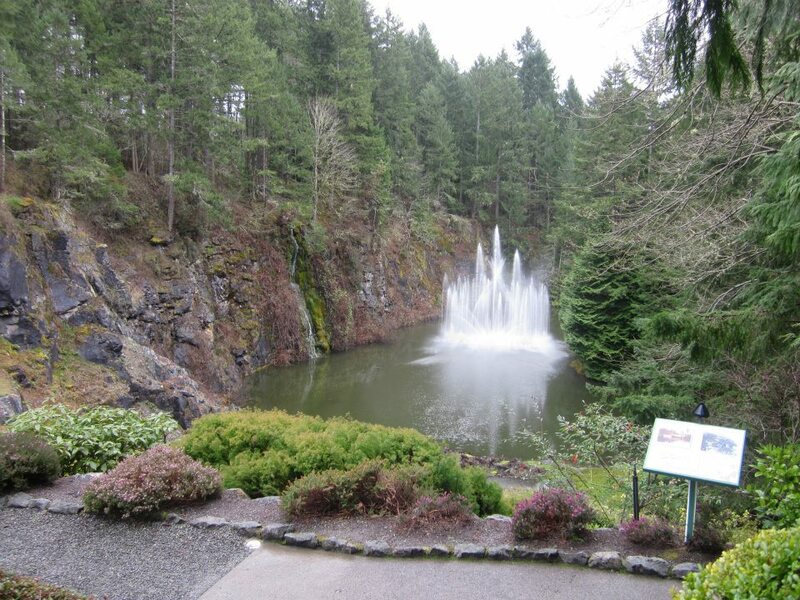 * It started to rain, as we were warned it might do since Victoria is still considered part of that temperate rain forest, so we bought 2 umbrellas at the drugstore across the street & began our journey to Craigdarroch Castle. Our waitress had told us it was about 8 blocks. Well, I think they define blocks differently in Canada because I think we walked about the equivalent of 18 blocks…mostly uphill. Thankfully it quit raining after just a bit, so we wandered along in the weak sunshine. The thing about the castle is that is sits on a hill, so we’d think we were close to it…only to round a little bit of a curve & see it disappear again. We finally made it to the castle & explored all 4 floors & probably about 50 rooms. Lindsey was intent on reading every single plaque on the wall, so I just wandered along with her & made comments along the way. 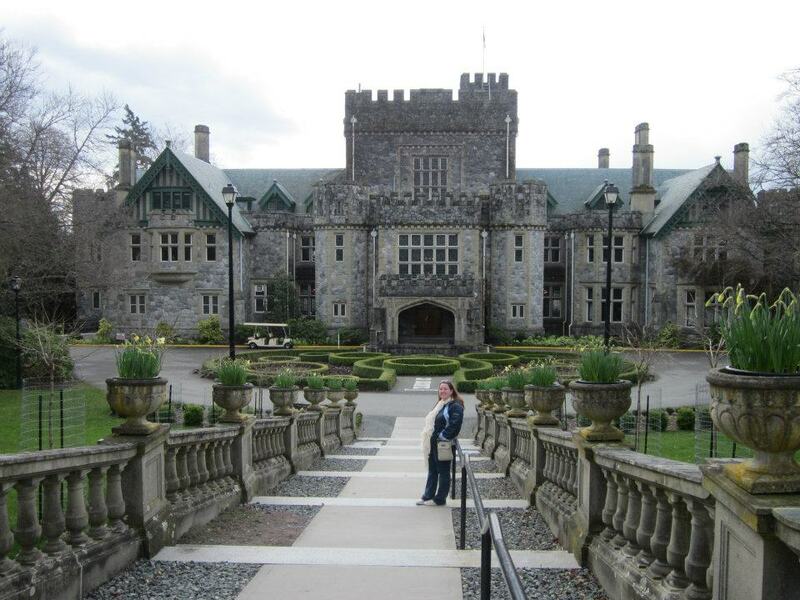 It was pretty fascinating & what was more interesting was the son who grew up in Cragidarroch Castle went on the build Hatley Castle to show all of Victoria that his family was wealthy & has always been that way & would continue to be that way. I preferred Hatley to Craigdarroch, Lindsey preferred Craigdarroch to Hatley – go figure. 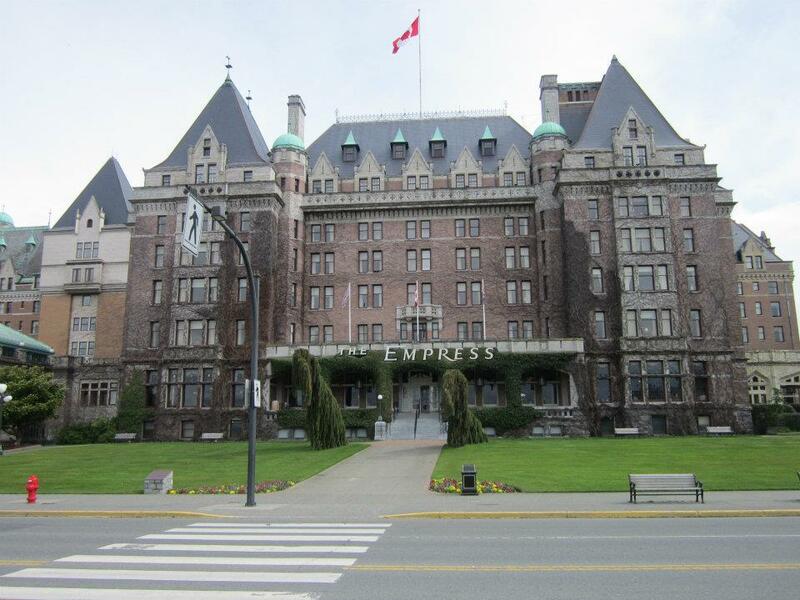 ﻿We were so thoroughly worn out after our first full day in Victoria, once we trooped the 18 blocks back into downtown we explored Thunderbird Park & ate supper at the Spaghetti Factory before we wearily crawled into bed at the Inn. 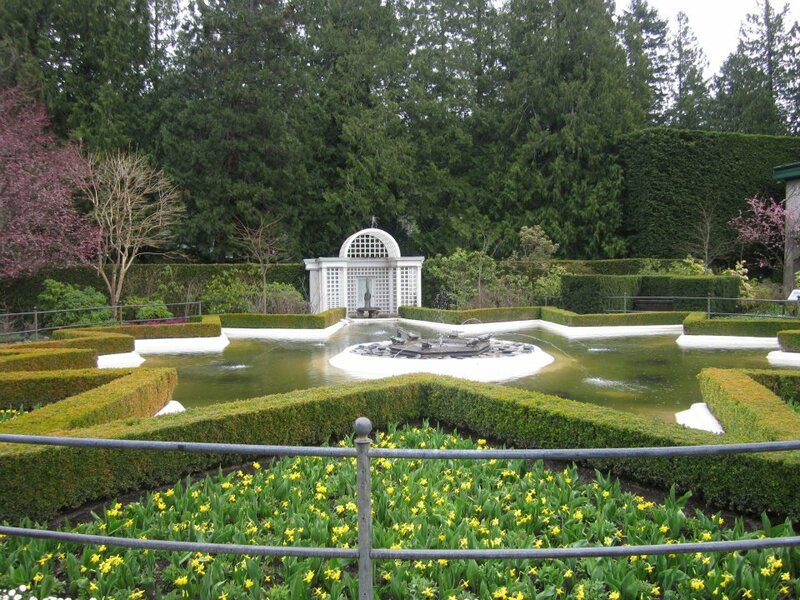 We decided the next day to rent a car because we wanted to go to Butchart Gardens & we’d been told that riding the bus took about an hour & the bus only came/went every couple hours. So, with map in hand we drove our rental car off the lot & headed out for adventure. 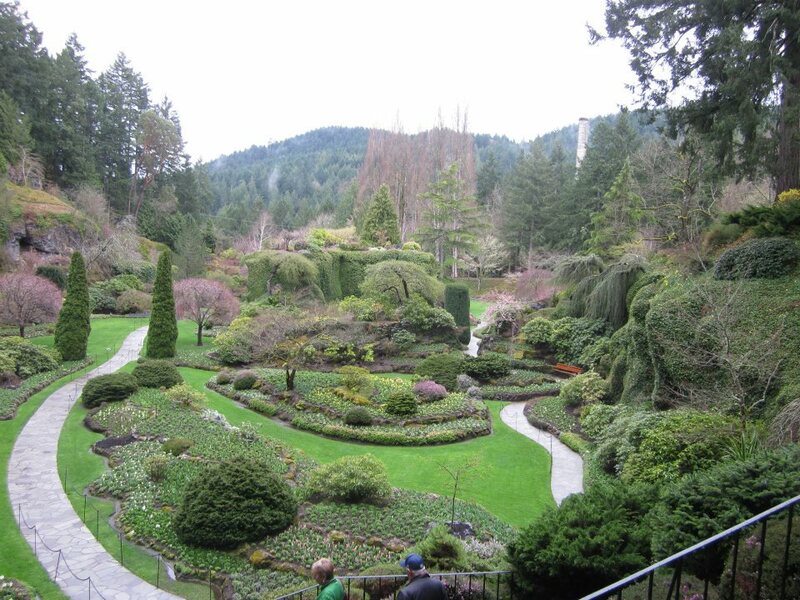 We found Butchart Gardens almost too easily – but let me detour a minute & tell you that Canadians like to drive very slow. I tend to have a bit of a lead foot, so this was a problem for me. We were cruising down the highway (I guess it’s not an interstate highway if you aren’t in the States…ha-ha) and the speed limit said 80 kmh. Did you know that 80 kilometres is about equal to 50 miles? So the max speed limit was essentially 50 miles per hour. I felt like I was crawling! We got there all the same & I managed not to get pulled over for speeding, even though I did keep having to check myself – but let me get back on track. 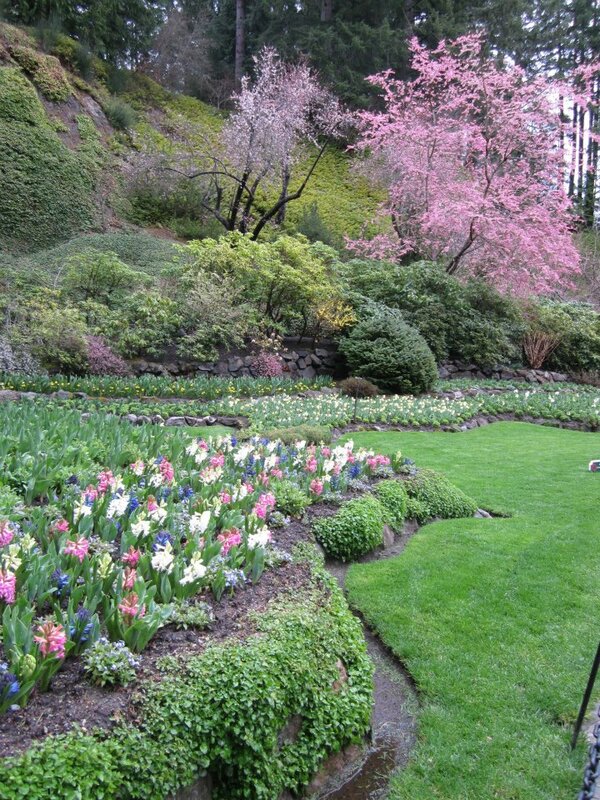 Butchart Gardens has been “in bloom” for over 100 years. It is gorgeous, even in the rain – which yes, it was raining when we were there. We helped ourselves to the clear umbrellas they provided & explored anyway. It was beautiful & well worth the drive. 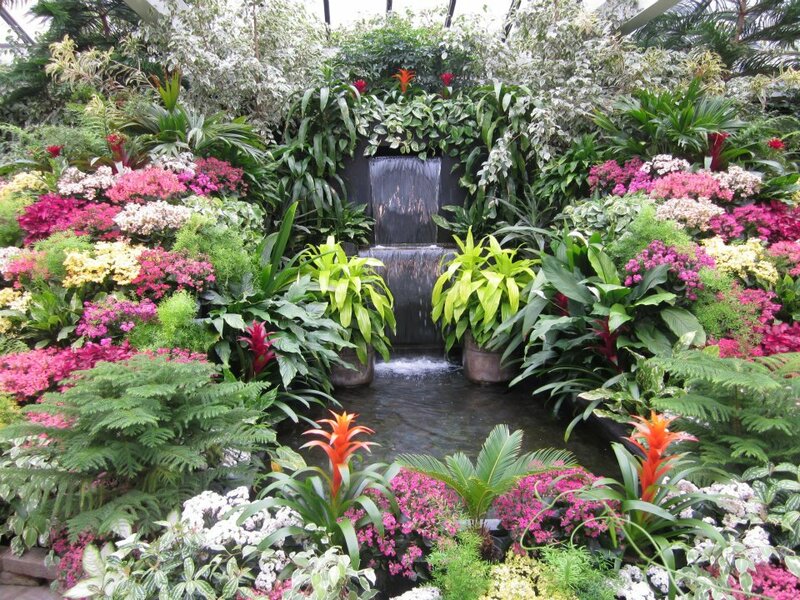 This picture is from the greenhouse…the rest are outside. ﻿Lindsey & I thoroughly enjoyed wandering through the gardens, even in the drizzle. We found a Cajun restaurant in Brentwood Bay, which was near the gardens. We were thrilled & a little surprised to find Cajun food in Victoria, but someone pointed out to me later that Cajun people often have French influence & since Canadians also have French influence that might have been the uniting factor. Whatever the reason, we were glad to have some good home cooking for lunch that day before we ventured back into the city. 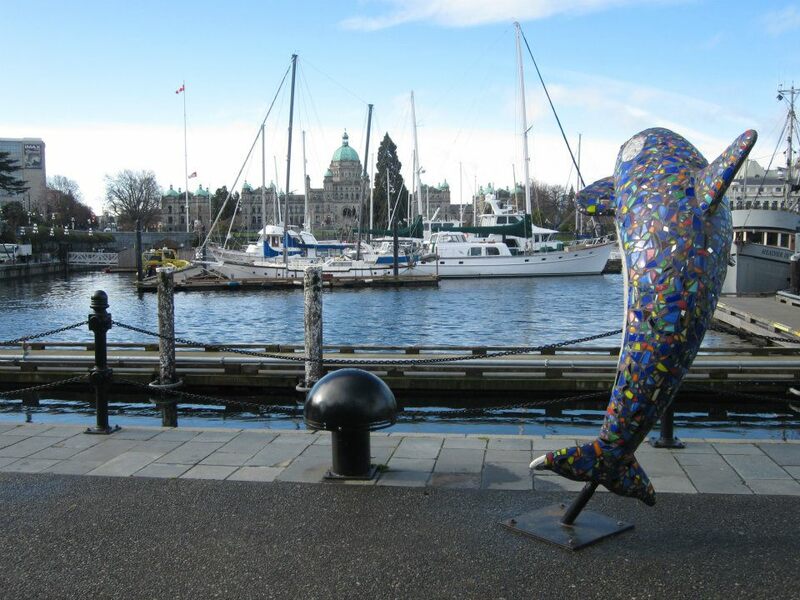 We explored some parks in downtown for the afternoon before stopping in at the Fisherman’s Wharf to get supper at Barb’s Seafood. 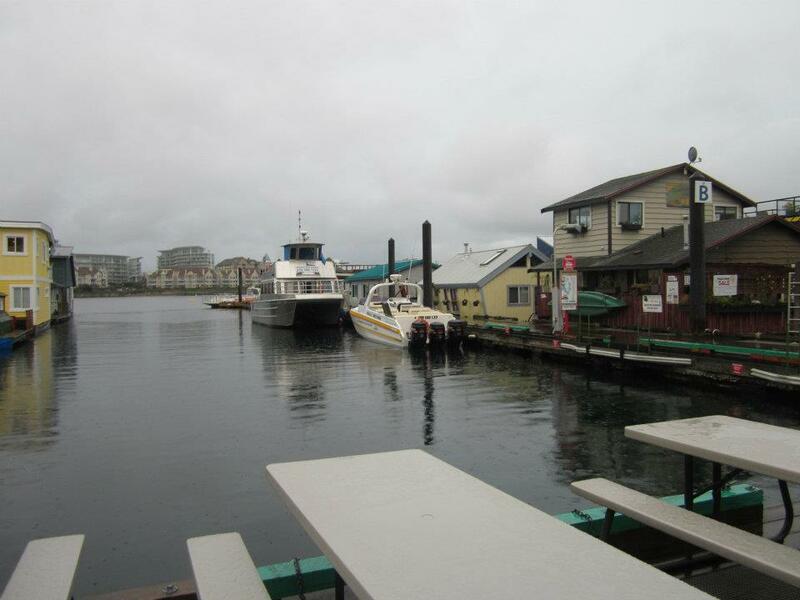 I had to take a picture on the wharf because of all the house boats; I thought they were so neat, now that I think back I also wish I’d taken a picture of the paddle up windows at the restaurants on the wharf. ﻿Lindsey & I got up the next day to catch the ferry back to Washington – this time the ride was a little more choppy, but still not so bad. All too soon we were back in the States & at the wheel of the car, winding our way along the coastline to Seattle. 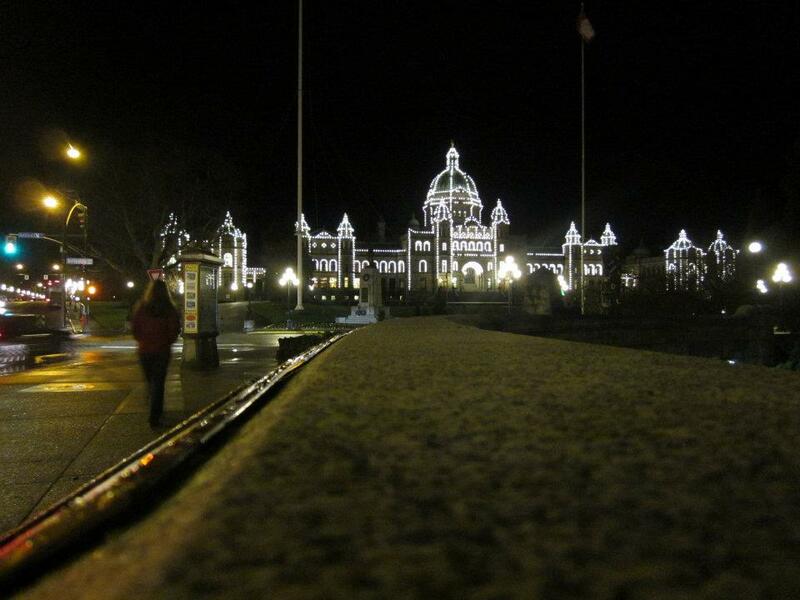 Before we move on to Seattle, I have a couple more pictures of Victoria. ﻿Lindsey & I thought we’d just be driving right on into Seattle, but we saw on our GPS that the next stop on the route was to board the ferry. We were a little confused, but soon enough the road we were on came to an abrupt end, the only option being that you boarded a ferry to take you across the Puget Sound & further our destination. We just went right along & before we knew it we were back on land & cruising into downtown Seattle. We stayed downtown the night we were there, we were mere steps from the Pike Place Market which was really neat! It was so windy the evening we arrived in Seattle, the wind felt like it was trying to physically tear your hair off your head. We sought refuge in the Hard Rock Cafe & ate some supper. 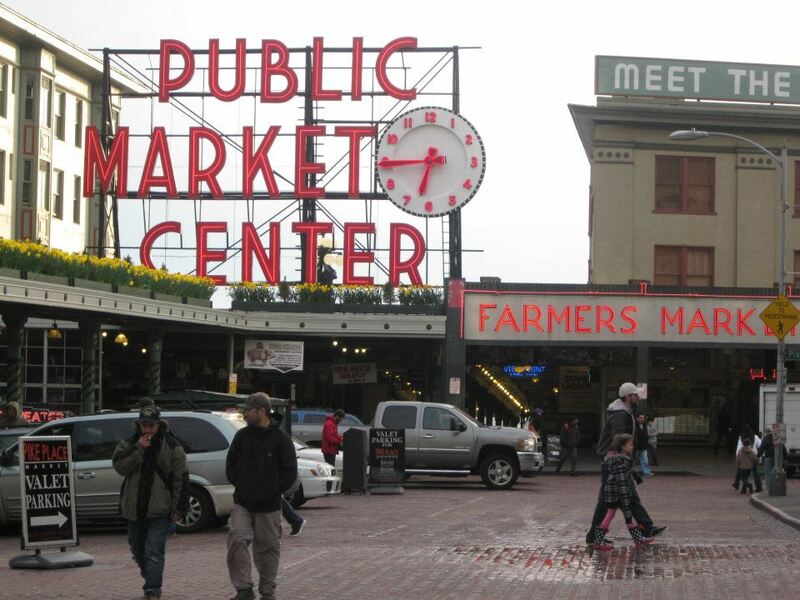 We had an early night so we’d be ready to explore the Pike Place Market the next day. 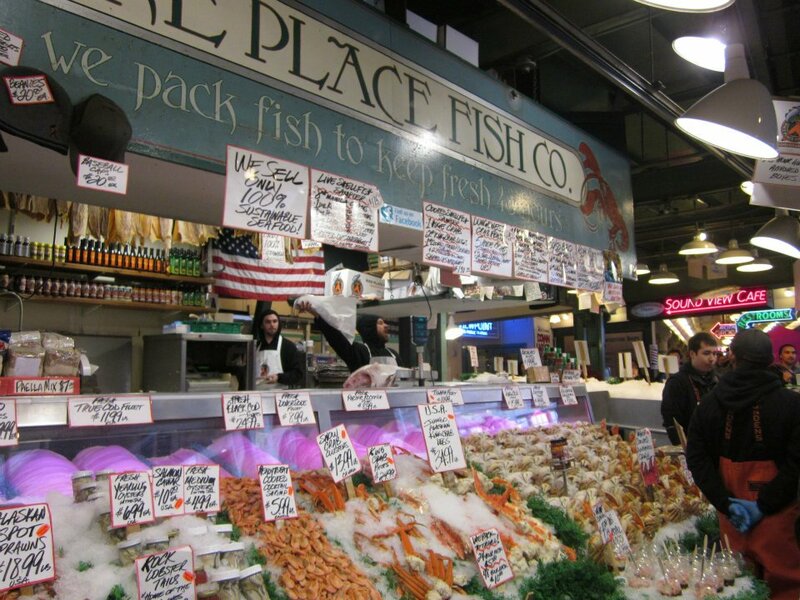 The Pike Place Market has been located on the waterfront of Seattle since it was first opened in 1907. 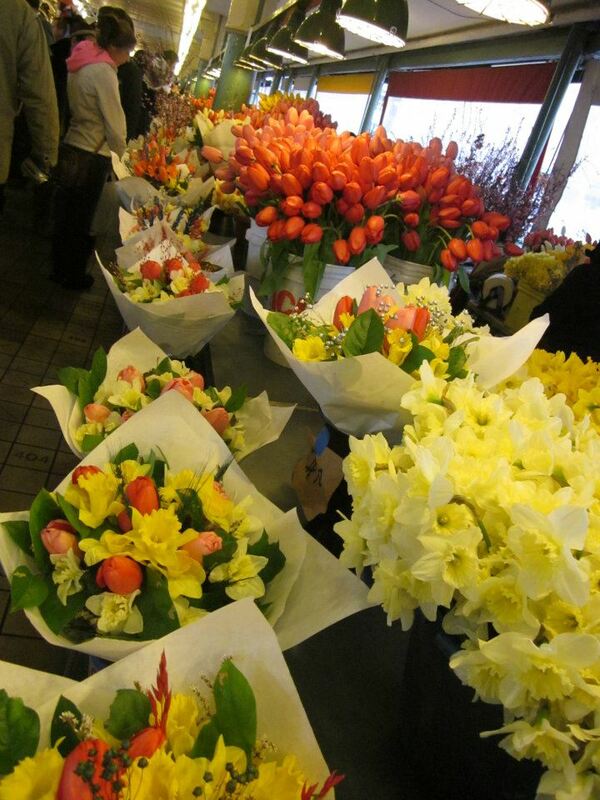 It is nine acres of shops selling anything & everything you can imagine but is certainly famous for the fishmongers that spend the days tossing fish as well as the beautiful flowers that go on for miles & the fruits & veggies that are everywhere you look. Lindsey & I watched the fishmongers toss a 21 pound halibut like it was nothing & sampled some famous Washington apples from a fruit vendor. The Pike Place Market is also home to the first Starbucks, so of course we joined the line of people waiting for coffee so we could say that we’d had coffee at the first Starbucks. If you’re interested, I got a white chocolate mocha & Lindsey got a chai latte. 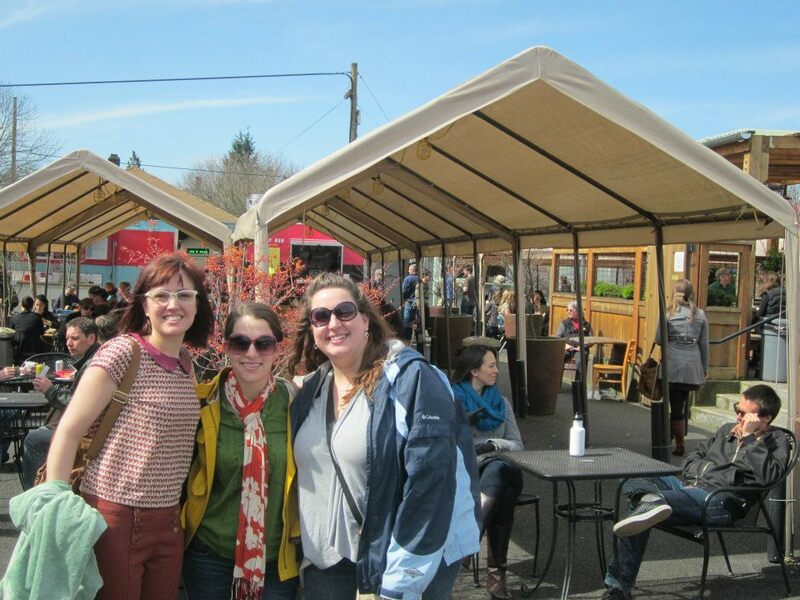 After a delicious lunch at the Pink Door, we explored a bit more of the market & then headed back to the B&B to pack up. We were headed to a hotel near the airport, but first we had a date with the Space Needle. ﻿I am – as previously mentioned – not a fan of heights. I wasn’t entirely sure how I was going to handle going to the top of the Space Needle, much less staying at the top for an extended period of time to eat supper. I mustered all my courage though & up we went. I’m certainly glad I did because we had an awesome time eating at Sky City, the rotating restaurant at the top of the Needle. We both started our meal with some soup; I had cream of potato & leek, Lindsey had clam chowder. I had prosciutto wrapped chicken with potatoes for supper while Lindsey had…well, I can’t completely remember. Oops. Salmon! She had salmon with potatoes & some asparagus maybe? I know she had salmon. We both got dessert, she had the apple cobbler while I had the Lunar Orbiter – which was a glorified ice cream sundae but had dry ice surrounding it for a cool smoking effect. 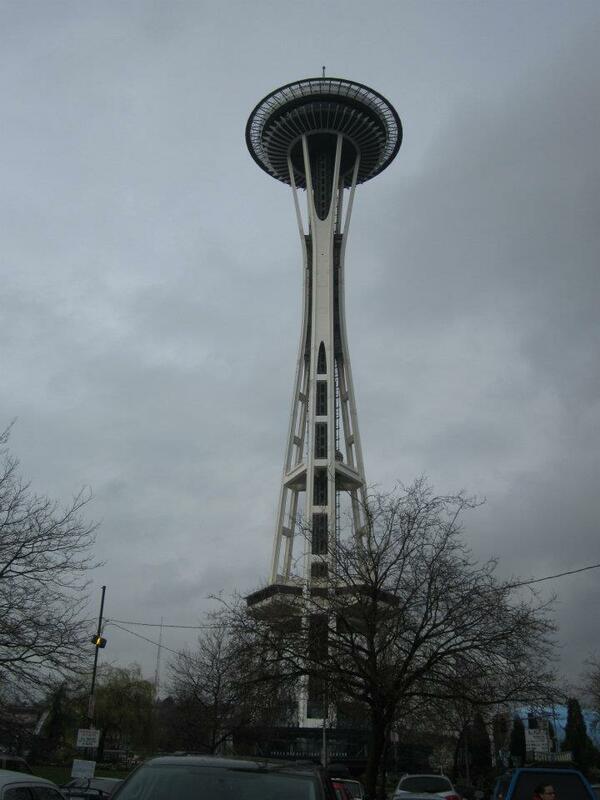 The Lunar Orbiter was the premiere dessert when the Space Needle’s restaurant premiered at the World’s Fair in 1960. After our awesome meal, we headed towards our hotel at the airport. I conquered the Space Needle! ﻿My flight left at 8 in the morning, Lindsey’s flight didn’t leave until 10. I am always restless before I fly, so I finally just got up at 5:45, got ready & went down to eat breakfast before catching the shuttle to the airport. I gave Lindsey a sleepy hug before I left; she was still in the bed & I’m sure she stayed right there dead to the world until about 8:15. I was already airborne by then. 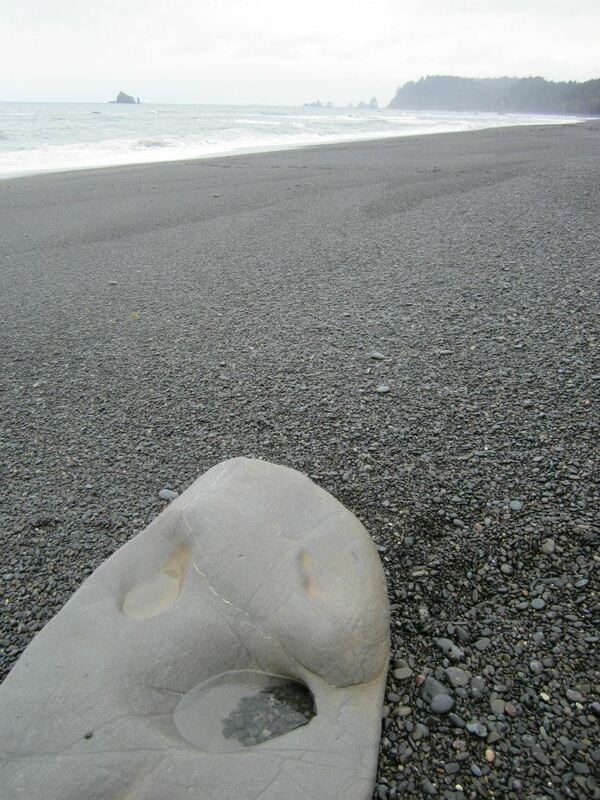 I had a small hiccup at security; the rocks from Rialto Beach were a little odd & so they had to search my carry-on bag. Thankfully rocks aren’t considered weapons so I was allowed to hang on to my free souvenir & climb onto the plane. The flights home weren’t bad, although they were a little bit bumpier than the flights heading out to the Pacific Northwest. Because of the crazy time zones, I left Seattle at 8:10, was on a plane for 4 hours & arrived in Atlanta at almost 4 in the afternoon. By the time I finally got back to Meridian, it was 7:45 at night & I felt like I’d wasted almost a whole day, but I guess that is how it goes with flying sometimes. Let me preface this by telling you that I think I’ll only cover Portland & Forks in this post – if I were to blog about the entire vacation in one post, no one would read it (but maybe my Momma) because it would be too long. That being said…here we go! I was completely spastic about this flight because it takes five and a half hours to get from Atlanta to Seattle. I’m not so friendly with airplanes until I’ve been medicated, but once I have those pills – things are good to go. As you can see in the picture above, I’m on a plane & I’m completely cool with it. Only because of drugs. 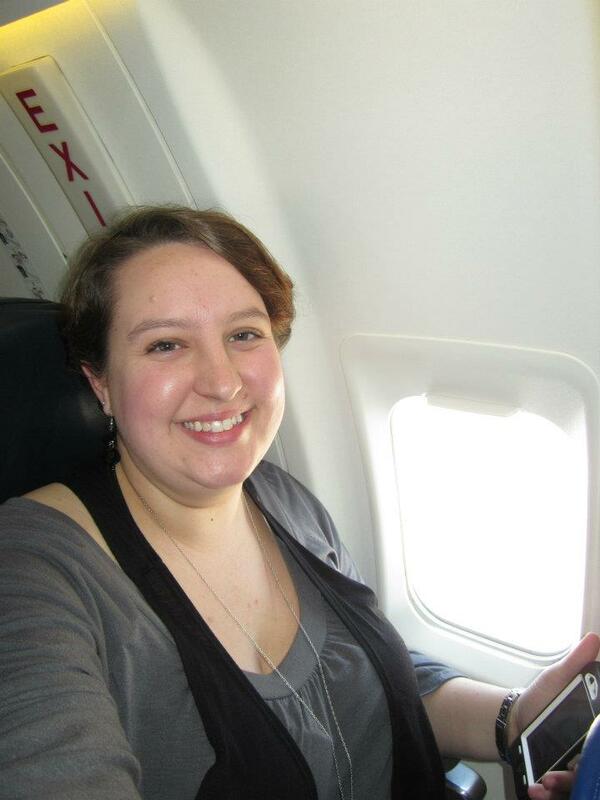 Both of my flights were smooth & I had a little TV set in the headrest in front of me as well as a book & a magazine to distract me – plus, I had a window seat & I spent a lot of time peering out the window to see what I could see. Terrified of heights & flying, but give me those pills & all I can do is look out the window to see how high up we are & see how tiny everything looks from 5,000 feet. Go figure. 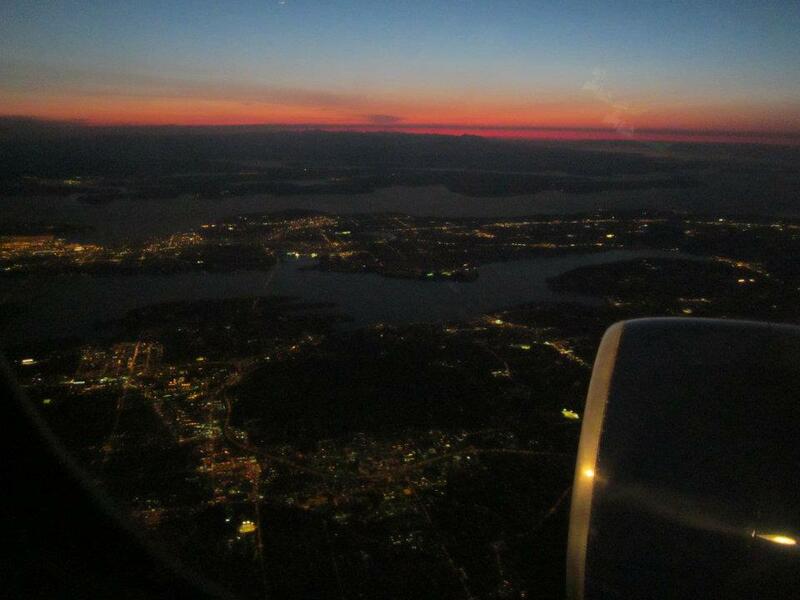 Seattle at night….so pretty at sunset! ﻿I didn’t have any complications getting to Seattle, getting my luggage & getting to the hotel. Unfortunately Lindsey got a little delayed, but by about 11:30 (Seattle time – which felt like about 1:30 to me) we were reunited. There was not a lot of conversation – we had both had long days, so we hugged a lot & crashed. We had big plans to get to Portland the next day as quick as we could – we were ready to explore & knew we didn’t have much time. Also – we were going to see Dee, one of my sweet best friends that I’ve known since I was about 10 but hadn’t seen in over 2 years! Lindsey & I had about a 2 hour car ride to get all caught up & discuss important things, so we took care of all that. 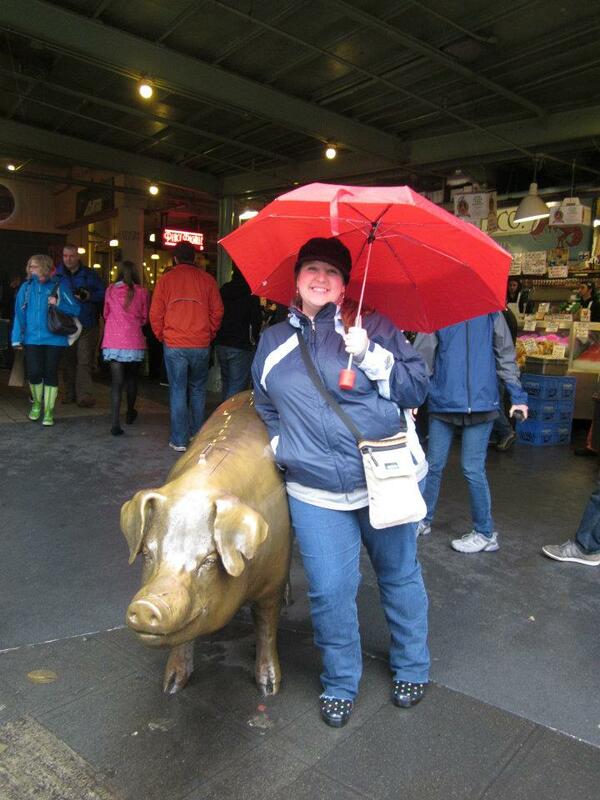 Portland was really a neat place – we found Dee & her husband Chris lickety split & we were off to get some lunch. We went to a place that Lindsey & I thought was absolutely awesome. It was this big open area with tables set out & parked around the tables on 3 sides were food trucks selling all kinds of things. There was a truck called Burgatroyd that sold tons of different burgers (I’ll get back to this in a minute) a truck that sold waffles; I’m talking waffle sandwiches, waffles with fruit, waffles with bacon…Lindsey & I were torn after we saw the waffle truck. There was a truck that sold Oriental food – some kind of Kim chi burritos & all that jazz (not my cup of tea, but Dee & Chris were digging in) and there was a truck that had down home Southern cooking – straight from Vicksburg Mississippi! 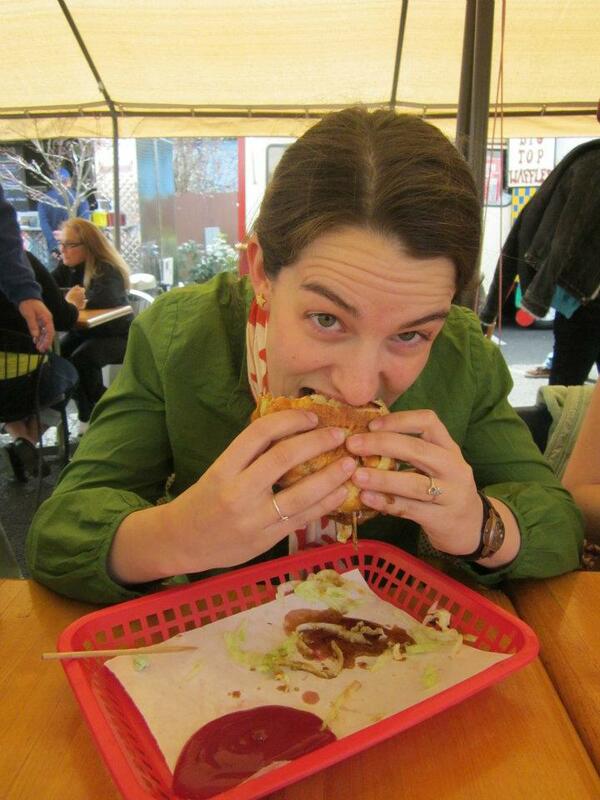 Lindsey & I both decided on Burgatroyd – everything just sounded way too delicious but we went with a good ol burger. Lindsey got a burger that had pineapple & all kinds of other goodness (I honestly don’t remember) & I got a burger that had barbecue sauce, onion rings & Swiss cheese. They were both divine. Chowing down on some of Portland’s finest! Just a few of the food trucks…and Dee! ﻿Dee & Chris were awesome to spend the day with – they’ve lived in Portland for about 3 years now & they knew the perfect spots to take us & just the right sights to show us. They took us in some quirky shops near their apartment; we went in a store that sold nothing but light bulbs & it was big enough that you could get lost in all the aisles of bulbs: pink, blue, green, red, patterned, night lights of all kinds. They showed us 2 houses made of completely recycled materials. Chris took over the driving (thank the Lord) and they took us all over town. 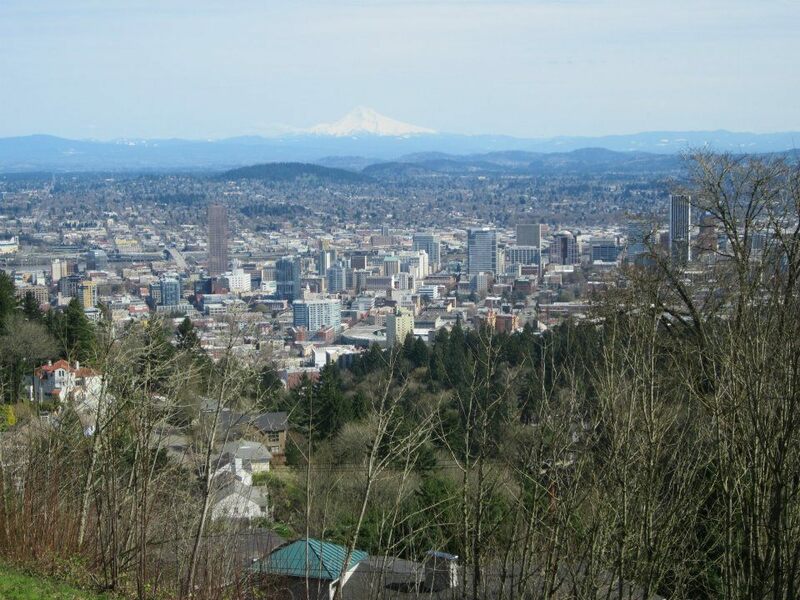 We went to the top of a big hill to see the Pittock Mansion which offered some amazing views of the city of Portland. Dee summed up the Pittock Mansion by telling us that the Pittocks were the wealthiest people in early Portland & so they built their mansion on a hill so they could look down on all the peons in Portland. That was a good enough description for me – Lindsey read the plaques though, maybe she could tell you more. 🙂 They took us around the quirkier communities in town, we got Bubble Tea & bought chocolates at Moonstruck Chocolates & then we ventured down the the Willamette River & wandered around a bit, before eating supper at a place called Harvey’s in Portland – it was delicious – and then we explored Powell’s Books – the worlds largest bookstore. You know how you see commercial that say “there’s an app for that”?? Well Powell’s Books – there’s an app for that. ﻿Lindsey & I took Dee, Chris & Goob (their cat) to the hotel they were staying at for the night – they moved to North Caroline the day after we visited, so they had a final hurrah with us – and then we went to our hotel. 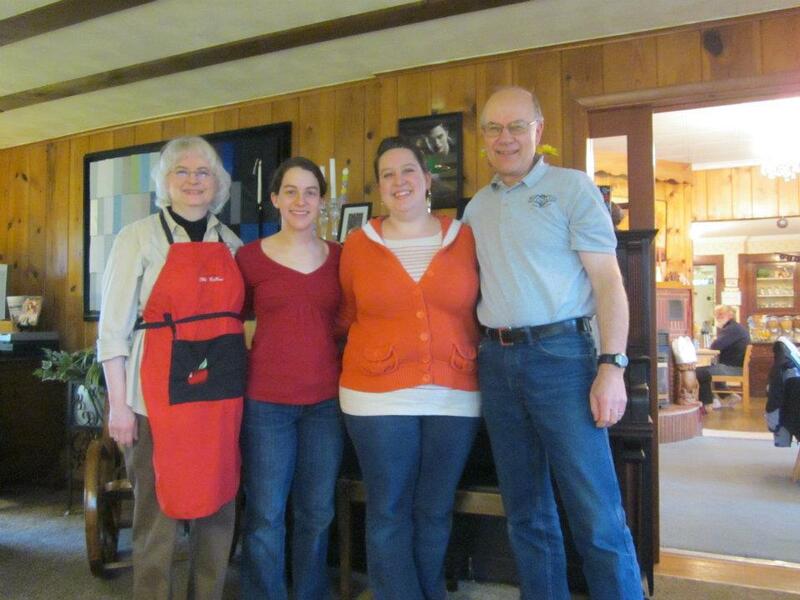 We stayed at The Kennedy School, which I had found online & Dee had also suggested to me. It was an elementary school in the early 1900’s and once they closed it in the 1970’s, McMenamins bought the place & converted it into a hotel! It was certainly one of the more unique places I’ve ever stayed before. Detention was a cigar bar, the Honors room was also a bar (apparently you get to party whether you’ve been bad or good) and the old auditorium has been converted into a movie theater & if you’re staying at the hotel you get into the movies for free. The gym was turned into a banquet area & all the classrooms are now guest rooms, still complete with chalk boards for your writing, drawing & doodling pleasure. Lindsey & I weren’t actually there for very long, but we did manage to explore the place pretty thoroughly before we set out on our drive the next day. I’ve already finished the Spring Reading List…have you? ﻿I said at the beginning that I’d talk about Portland & Forks, but I totally forgot that we stopped off in Astoria on the way between the two! 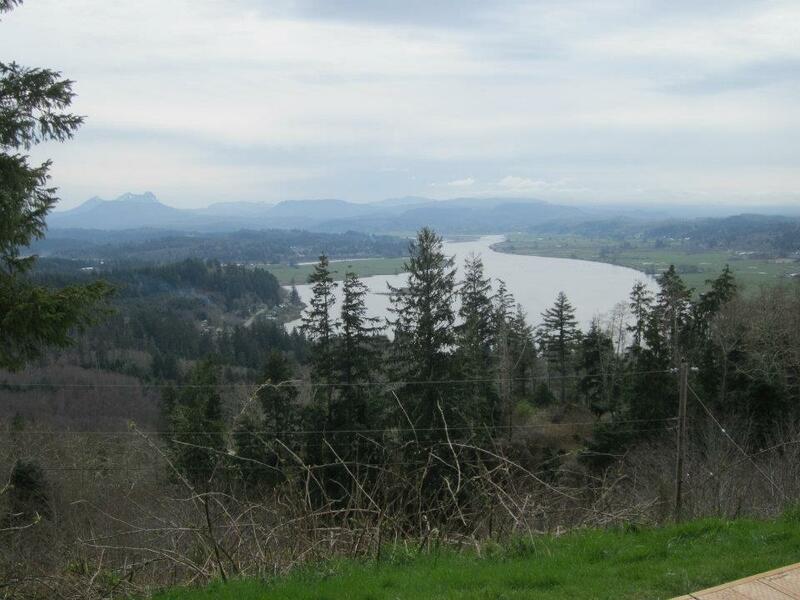 I’m not sure how I forgot about Astoria because it was absolutely beautiful. Astoria is on the coast of Oregon & a friend of Lindsey’s had recommended it to us, so we decided to stop in, which was an excellent decision. The views were amazing & we ate at this little cafe that was so wonderful – it was one of those hole in the wall places that you’d never think to stop into (thank you Fodor’s travel guide for the suggestion) but once you were there, you knew it was going to be good. They served this freshly made bread with garlic, jalapeno & chili pepper jams, which might not sound so good, but trust me when I say it was delicious. They had crepes, which Lindsey & I both had – I got green apple & Lindsey got fruit compote – they were great. There was this very cute guy sitting at the counter by us & he was telling us all about how good the sturgeon grilled cheese was. Sadly, he left before I could try to sneak him into a picture. I’m not so sure about that grilled cheese, but he was very yummy. Ha-ha! 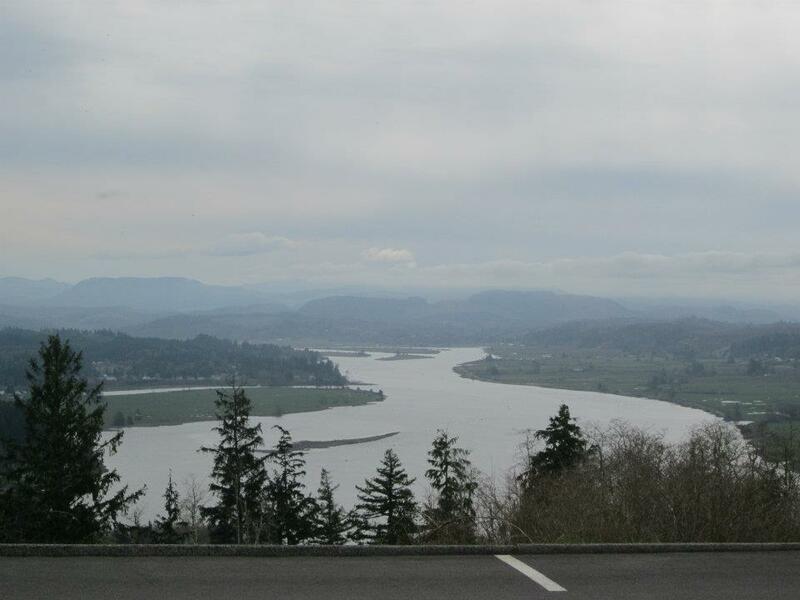 After we ate, we drove to the top of Coxcomb Hill where the Astoria Column is located. The Astoria Column was built in 1911 & you climb up about 100+ steps to the top for panoramic views – Lindsey climbed to the top, I didn’t. I don’t do heights if you’ll remember. Plus, the views at the base of the column were pretty spectacular as it was. 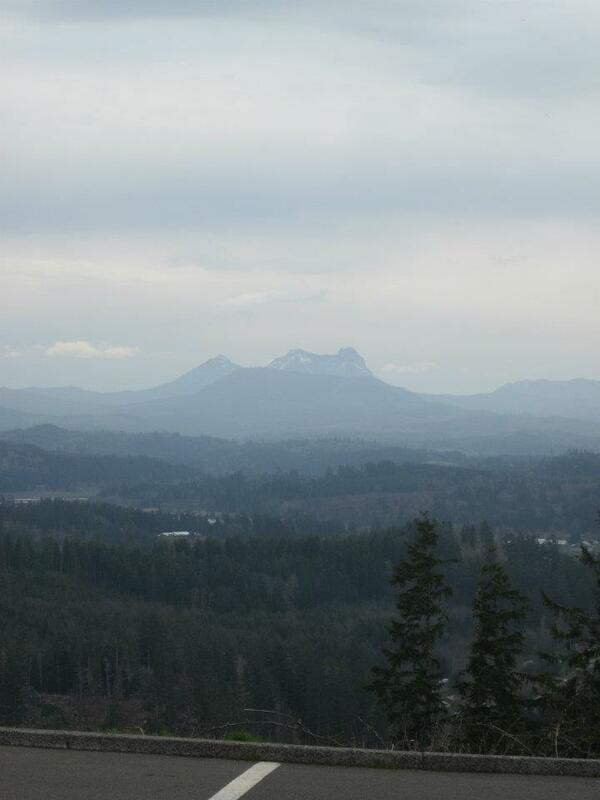 ﻿Once we left Astoria, we had about a 3 hour drive to Forks but the scenery was so completely fascinating. There was rugged coast for a little while but before long it turned into amazingly dense forest with more green than I’ve ever seen in my life but later while the green & forests remained we reaches the Pacific Ocean & we had forest on one side & the coastline on the other. We went through all these sleepy little towns that were named for Indian tribes, most of them looked like they’d been there for years. After 3 hours we were rewarded with an awesome sign as we rounded the corner & came out of the dense forest: Forks! OK – now where is Edward Cullen? 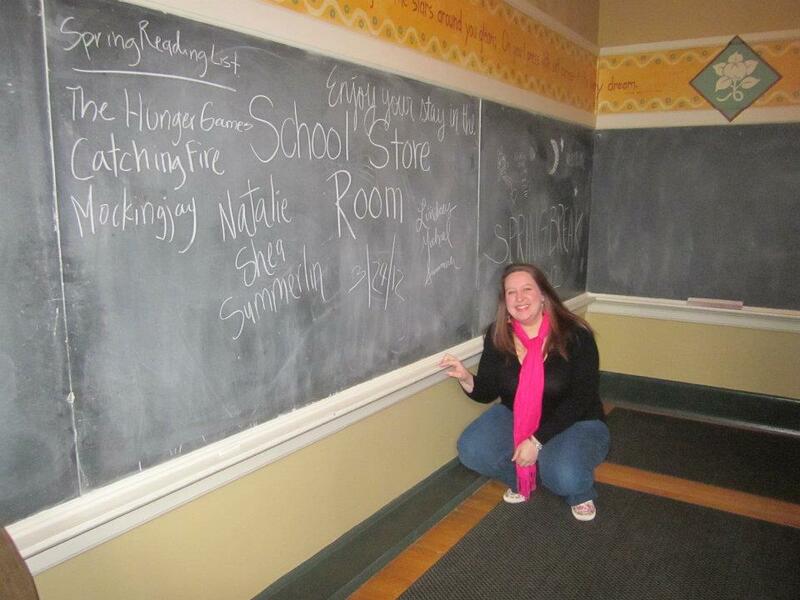 ﻿I will preface the next part of this entry by telling you that I am a Twilight geek. I will confess to it. So is my sister – so we definitely had quite a few moments over the next 48 hours. 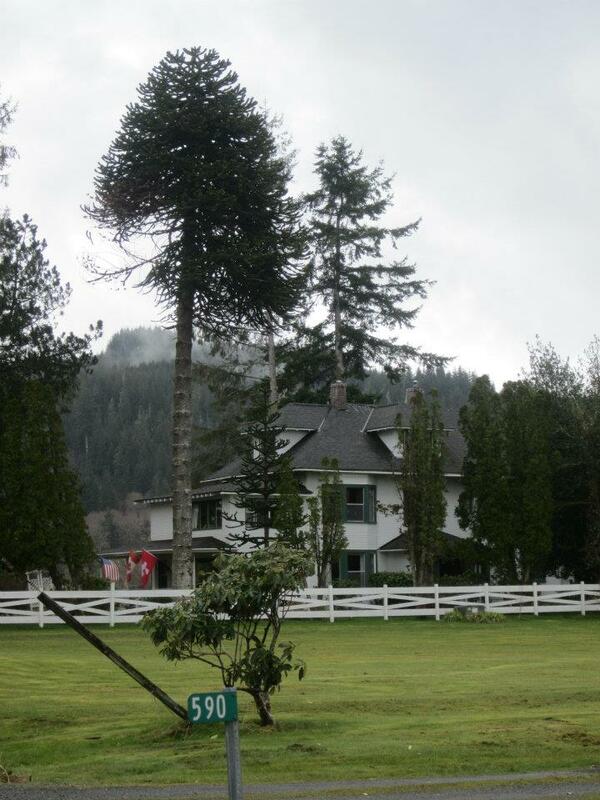 Our Mom had found a place called The Cullen House that was a B&B that supposedly matched almost perfectly the description that Stephanie Meyers gives of the Cullen home in “Twilight”. 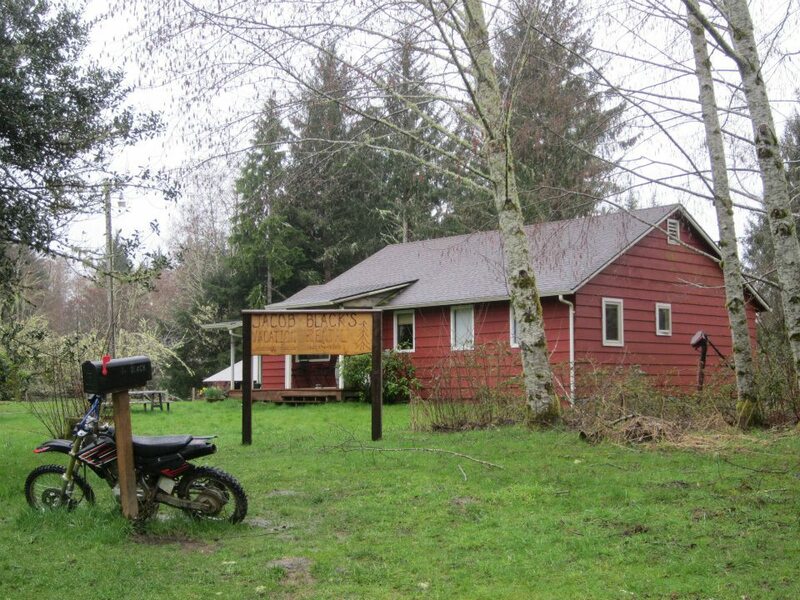 We were so thrilled with the house – the couple that run the place just had so much of the house perfectly detailed with parts of the book that we were have little freak outs pretty consistently for the first hour that we arrived in Forks. The couple that owned the house are used to that though, they just went right along with us. The Cullen House & just one example of their attention to detail. ﻿Lindsey & I spent the next day exploring the beaches of La Push, looking around the Quileute Reservation & exploring the town of Forks. They have locations from the books mapped out all over town & they’re pretty easy to find because Forks is basically a 2 stoplight town – it really is kind of a hole in the wall, but it was an awesome hole in the wall. We had numerous moments of pure geek out seeing all the sights that are mentioned in the book. 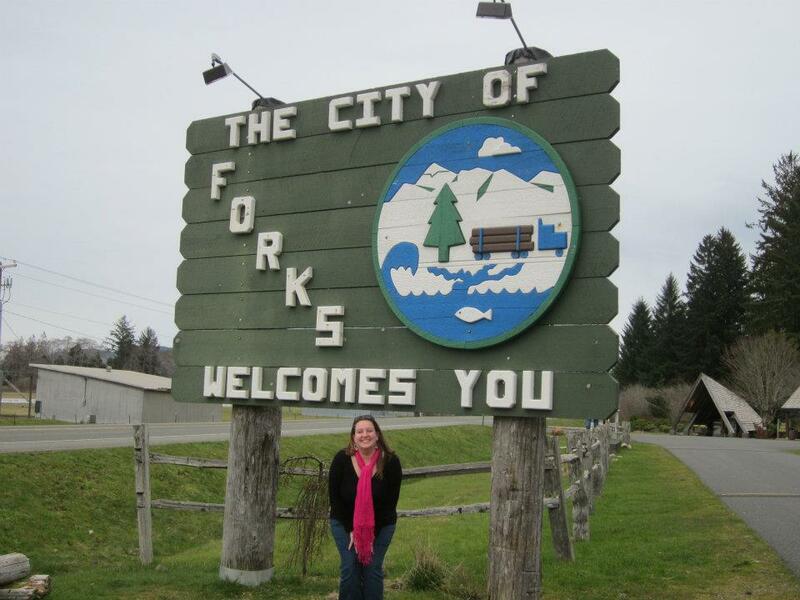 The story of Forks is really pretty fascinating in & of itself – the town is a logging town but was really almost on the point of collapse when Stephanie Meyer decided to set her books in the town of Forks. Since the book was published on October 5, 2005 the town has seen a seriously dramatic upswing in tourists & now has tourism to thank as it’s number one source of income – people come from quite literally all over the globe to visit this little 2 stoplight town that is the setting for their favorite books. Its amazing. 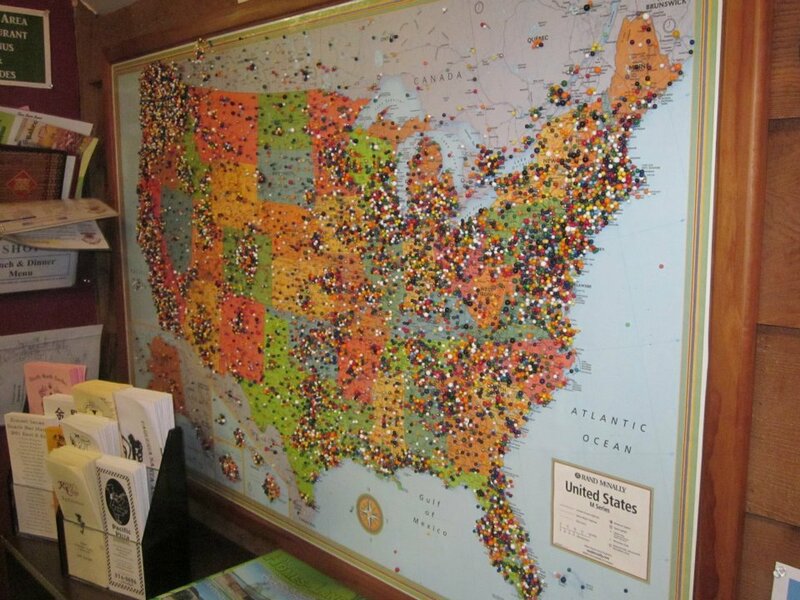 I took a picture of the United States map in the Chamber of Commerce; it is covered in pins…I mean, pins everywhere. The girl at the Chamber of Commerce told us that before Twilight came out, the board averaged about 25-30 pins a year. Insane. 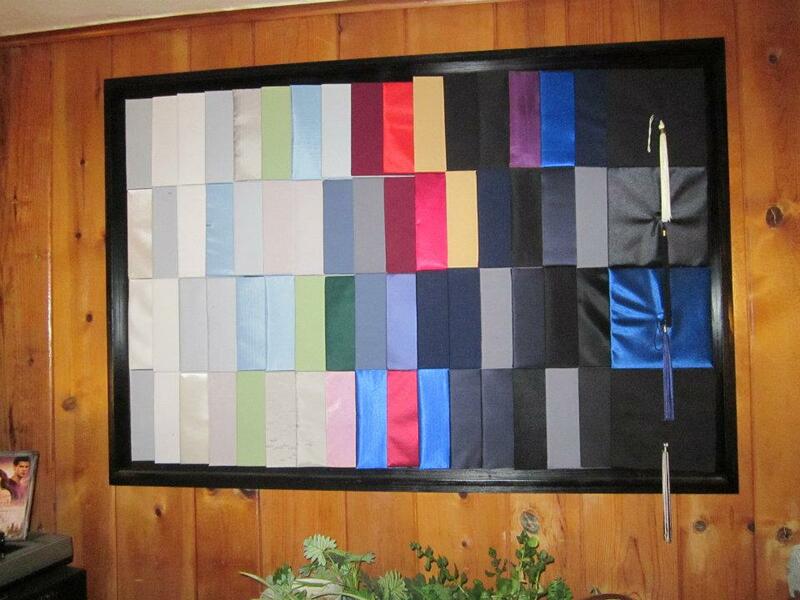 There is also a map of the world & it has just as many if not more pins on it. ﻿The beaches were so gorgeous – completely different from the sandy, bright aqua beaches that I was used to seeing but absolutely amazing in their own way. We hiked to Second Beach & let me tell you, they make you work for your beach experience in Washington – we walked through a forest so dense that once you stepped onto the trail & walked a few steps, it was like the world outside the forest disappeared. We were enveloped in greenery, the sound of birds & the gentle pitter patter of raindrops falling onto the canopy of leaves above our heads; and yes, it rained. A lot. The Pacific Northwest, where Forks is located specifically is a temperate rain forest & Forks gets on average 10 feet of rain a year. When we were there, it was late March & they’d already gotten over 7 feet of rain. Once we emerged from the forest & onto the beach, we had to climb over & around numerous fallen pieces of driftwood that littered the edge of the forest, but from there it was nothing but dark sand, huge rock formations & crashing waves. 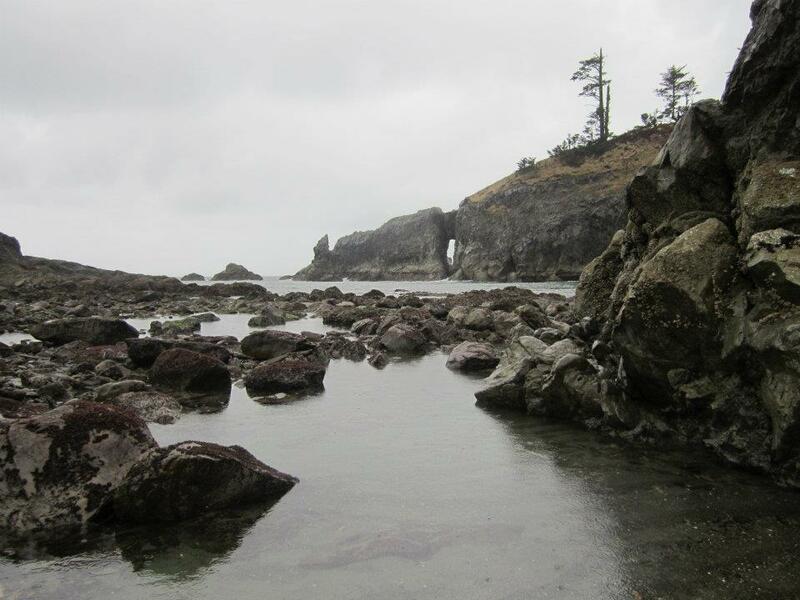 The tide was out, so we tried to look for tide pools but it was a little difficult – it was raining so hard it was almost coming down sideways & it was only about 50 degrees outside. We wandered the beach for a good 20 minutes taking pictures, hopping around in the sand & surf & then we headed for the shelter of the trees. 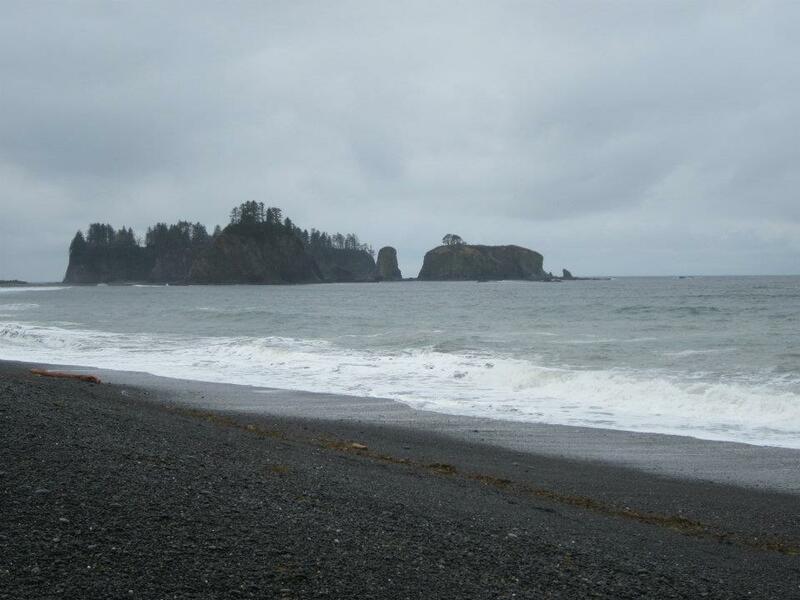 We drove to First Beach, which was much like Second Beach & then headed for Rialto Beach, which we explored since the rain had let up. There were more rock formations – also called sea stacks – but the beach was covered in not sand, but millions of gorgeous, smooth polished stones. We collected some for our pockets, took pictures, dodged the waves & headed for the car. I took quite a few pictures…here are just a couple…the first two are from Second Beach & the second two are from Rialto Beach. 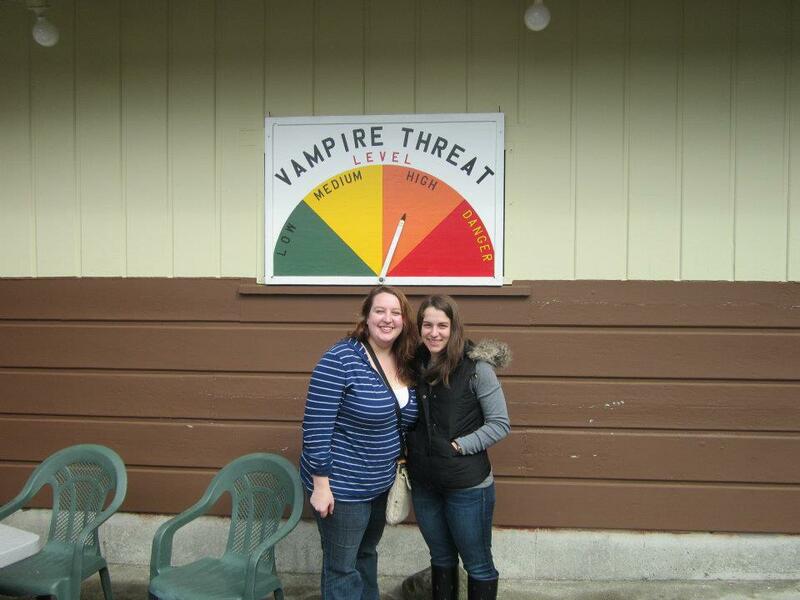 ﻿The people of Forks & La Push have really embraced the whole Twilight craze. Lindsey & I ate at a restaurant called Sullys, which was just your run of the mill burger joint but they offered something called the Bella Burger, which had Swiss cheese & was served with fangs. The local grocery store/outdoor store sells name tags that say Bella S & they often page Bella Swan over the loudspeaker. It is a pretty neat thing that people have just taken it all in stride & added a little bit of Twilight to their every day life. 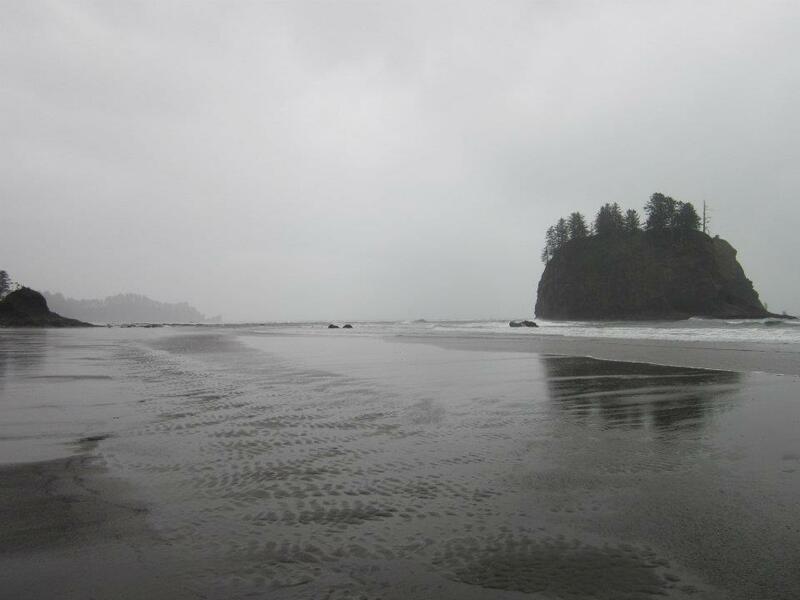 I couldn’t see spending an extended period of time in Forks – but I told Lindsey that it would really be nice to have a little house there & be able to spend about 5 days just relaxing, walking the beach & exploring tide pools, watching the rain & just taking a time out. 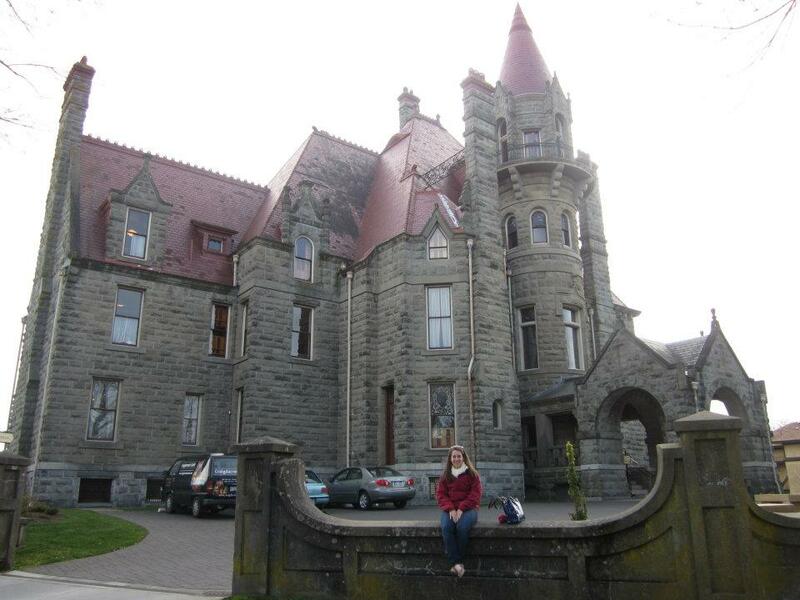 If you happen to be a fan of Twilight, Forks is most certainly a place you want to go. ﻿I’m going to end this post – Lindsey & I ventured on to Victoria & Seattle, but this post is already so long, so I’ll leave that story for another day…soon. I am seriously a bad blogger – I knew it had been awhile, but I can’t believe I haven’t written anything since February. I’m trying to decide what made March so hectic, but I really can’t remember. Granted I was on vacation the last 10 days of March but besides that I’m pretty sure I was up to a whole lot of nothing. I mean – if you consider working 8-5 Monday through Friday nothing…then yep, there you go. March – I’m looking back at my calendar & I just don’t see that much of excitement; I guess March was kind of slow & so maybe that is why I didn’t write. I know when I ended my last blog post I mentioned March coming in like a lion & it certainly did. On Friday March 2nd, everyone was worried about the weather getting bad & of course, so was I. I tend to worry about the weather far more than is healthy, but I suppose that is just one of the joys of being me. The weather never really got too bad; but for some wild reason the power went off at around 6:15 on that Friday night & so the challenge became trying to find something to do in the dark. My house gets REALLY dark when the power goes out. I mean – it is pitch black. I was pretty proud of myself though, I very calmly went around the house with my one candle & closed the windows I had open before I blew out my little candle & walked across the very dark yard to visit my Grandma. My dog is obviously just as paranoid about bad weather as I am, because he followed right on my heels all through the dark house; it is really a miracle I didn’t step on him. I know I was far too excited when the power came back on at 11:15 – I didn’t really want to spend the night in my pitch black house all alone; which is silly since I actually do that every night, but there is some kind of security in knowing you can flip a switch & illuminate the whole house. I was really glad to get in my own bed & go to sleep as the rain faded away into the night. We were blessed though – the weather did get bad in other areas, but we were spared & that is something I’m always thankful for. I really don’t remember much worth mentioning happening in March. 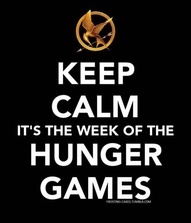 I went out with my best friend a couple times; I gave him my copy of Catching Fire after he consumed The Hunger Games in about a day. I knew once he got ahold of them there would be no stopping him from devouring them. Since there was still a week until the movie version of The Hunger Games came out & we needed something to do, so we rented the movie 50/50. Now, don’t get me wrong – the movie was good, it really was. But…oh geez. Let me preface this a little bit. The movie is about a guy that gets cancer & how he deals with it. The movie is billed as a comedic look at cancer, but I don’t really know if you can make cancer funny – but they certainly tried. David kept saying “Why did we rent this? It’s depressing!” but I was a whole other story. There were moments when it was funny, but then the next minute I would be crying like a crazy person. I was laying on the couch & I finally had to sit up because the tears were running down my face & neck & it was just getting irritating. I guess I must have really been getting pretty upset because Watson even came into the living room & crawled up on the couch beside me. David told me that I obviously needed to calm down because I was even stressing out the dog. Oh well – sorry for being too emotional. 🙂 It was a good movie though – rent it if you feel like a good laugh…and then a good cry…and then some more laughter…and then crying. I’ll blog about my awesome vacation with Lindsey here soon, maybe even this afternoon if I get the chance. There will certainly be some laughs with that one because the two of us can’t get together without some kind of hilarity – that is for sure. So, hope you enjoyed the small update for now. I’ll write again soon.